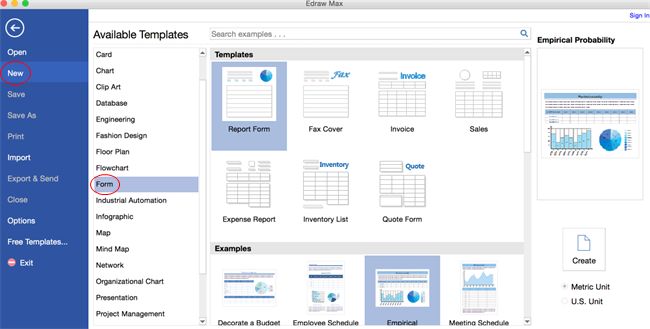 Create professional forms on Mac for your business. Here are full details on how to take advantage of built-in vector shapes to gain business form rapidly. With an advanced business form program for mac, making professional business form has become super easy. To save time, start with a form example. Double click the example you like. 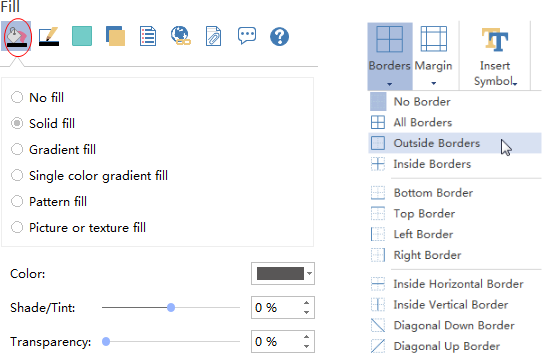 Drag and drop shapes from the Forms library to the canvas, such as Header and Logo. Use the dynamic guidelines to align shapes. Continue dragging other shapes onto the page to build the main structure. Position the pointer over logo shape and then move the pointer over the floating action button. ->Click Replace Logo. -> Select your logo. You can also insert your logo by clicking Insert Picture From File under Insert tab. To edit a table in the business form, select it and then go to Table tab. To insert a row, follow these steps: Rest the cursor to the left of a row. ->When the cursor turns into a dark black arrow, click to choose the row. -> Click Insert Above or Insert Below. To insert a column, choose a column and then click Insert Left or Insert Right. Rest the cursor above the border, when the cursor turns into 2 arrows, drag the mouse to resize a row or column. Alternatively, enter height and width value in Cells Size group. If you prefer, you can distribute all of the rows and columns evenly. Click in the table. ->Under Table tab, in the Cell Size group, click Distribute Rows or Distribute columns. To change fill of the form, you can also click Fill in the format task pane to the right of the canvas. To change borders, click the triangle under Borders button under Table tab and select the border style you need. To align multiple shapes vertically or horizontally, select the shapes you want to align, then, click the Align button under Home tab to align shapes. When moving a shape, the dynamic guidelines show to help you align it with the nearby shapes. To edit text, double-click the shape, place the cursor where you want to change the text, and then type. See the illustration below. To add more text boxes, press Ctrl + 2. Press Ctrl + shift + 2 to adjust text box. 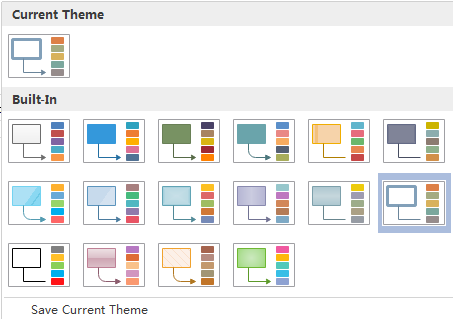 By changing Business Form theme, you can enhance fill, line and text style altogether at 1 click. Click Save on File tab to save as the default format. Choose Save as on File tab to save as other formats. The Save As dialog in Edraw presents you with many options. The top ten choices are the commonly used formats. 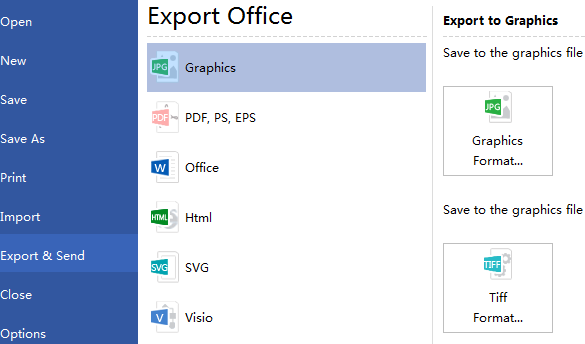 Hit Export & Send under File to export the form as needed format such as PowerPoint, JPG, PDF and so on. 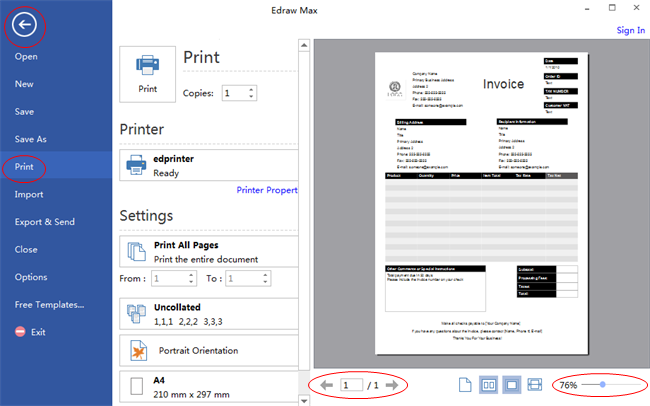 To print your drawing on only 1 paper, click More Print Setup... and then choose Fit to. Click here to view and download some nice business form examples.